Electronic Body Music, abbreviated as EBM, is a term whose origin stems from the Belgian group Front 242, chosen to describe their electronic music; cold and dancing, free of the dominant influences of the time. Powerful, cold and minimalist electronic rhythms were the hallmarks of this new genre. The movement quickly garnered followers with the British group Nitzer Ebb but also in the rest of Europe, with the likes of Borghesia and The Neon Judgment, later signed to labels like PIAS, Antler- Subway, Wax Trax!, Mute, Off Beat, Zoth Ommog, Pendragon and Metropolis. EBM’s popularity grew rapidly in the underground scene during the 1980s and early 1990s, especially in Europe, before breaking through in the rest of the world, also influencing the subsequent electroindustrial scene. 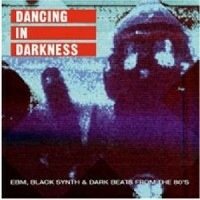 ‘Dancing In Darkness: EBM, Black Synth & Dark Beats From The 80s’ - to give it its full title - is a compilation of some of these bands; bands that changed contemporary music in terms of ideology, politics and aesthetics.